The project plans to have the special banana varieties—enriched with alpha and beta carotene which the body converts to vitamin A—growing in Uganda by 2020. The bananas are now being sent to the United States, and it is expected that the six-week trial measuring how well they lift vitamin A levels in humans will begin soon. "Good science can make a massive difference here by enriching staple crops such as Ugandan bananas with pro-vitamin A and providing poor and subsistence-farming populations with nutritionally rewarding food," said project leader Professor James Dale. The Queensland University of Technology (QUT) project, backed by the Bill and Melinda Gates Foundation, hopes to see conclusive results by year end. "We made all the constructs, the genes that went into bananas, and put them into bananas here at QUT." Dale said the Highland or East African cooking banana was a staple food in East Africa, but had low levels of micro-nutrients, particularly pro-vitamin A and iron. "The consequences of vitamin A deficiency are dire with 650,000-700,000 children world-wide dying ... each year and at least another 300,000 going blind," he said. Researchers decided that enriching the staple food was the best way to help ease the problem. While the modified banana looks the same on the outside, inside the flesh is more orange than a cream colour, but Dale said he did not expect this to be a problem. 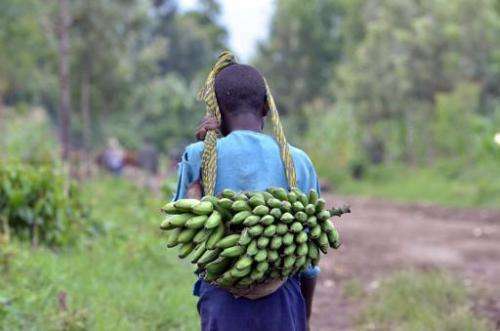 He said once the genetically modified bananas were approved for commercial cultivation in Uganda, the same technology could potentially be expanded to crops in other countries—including Rwanda, parts of the Democratic Republic of Congo, Kenya and Tanzania. "In West Africa farmers grow plantain bananas and the same technology could easily be transferred to that variety as well," he said. Unless Humans figure out to Convert EACH & EVERY Herb & Shrub on the planet into a Giant Tree, There is NO HOPE! The Plants do NOT have to Deliver Babies OR Lay Eggs as most Big ANIMALS do! It is high time to Play with the DNA of Small Plants ASAP to make it all possible! As usual, we can always start with useless herbs & shrubs! Imagine What it will mean to eventually have Rice & Wheat Grains as big as Coconuts! We can Sneak underneath such trees with proper protective Spring Cushioned Head gear & Armor, of course! I don't think the monopolization of globalised banana production would help the already suffering biodiversity of banana plants prone to fungi and pests and the economical independency of their farmers. The GMO organisms often contain residua of cytotoxic virus vectors and RNA used in their production. They can induce the food allergies and changes in intestinal tract. The inclusion of genetically modified (GM) plants in the human diet has raised concerns about the transfer of transgenes from GM plants to intestinal microflora and enterocytes. The terminator genes may cause the the failure of harvest in whole areas and they could spread into wild. Whenever Science goes against Religion, People start Freaking! Comments too reveal that! No Problem because it will become quite evident once that factor is known priorhand. You little corporate sluts need to pull your heads out of your butts! Just because reasonable people would like to question how safe GMOs are that doesn't mean it's "Science goes against Religion". Shame on you with your specious screeds. There is such a thing as genetic information being swapped between organism, as Jantoo does expound upon. You whore seem not to mind if the whole of our ecosystem and our bodies are used as experimental grounds for this tech with profits before people as the modus operandi. As far as the business is concerned, we already have seen the likes of Monsanto suing small farmers for growing corn from seed that was inadvertently pollinated by their GMO. That's just wrong! There is no need for science to meddle with Food Crops for a long time; There are several junk plants out there; ALL Preliminary can be done on them first...It will take at least 1 Decade of Serious Work. Eating GMO Crop is different from Working on Cell Biology of Food Crop which might mess up what little that is left for the human beings to survive. It is a VERY FOOLISH STEP to Mess up Banana Fruit like that! There are Cheap Tools to Carve Carrots into thin Spirals...if it is hard for one's teeth! Is this 'nana variant resistant to the dreaded fungal blight that may yet destroy the familiar 'supermarket' mono-culture crop ? And, please remember that carrots are NOT a ubiquitous crop. I am Man K. Man. To me the most interesting thing is the King Banana. it's possible effects on mankind. Why The IDIOTS do not Eat Their Own Garbage? These Religionwallas Are SinSuckers & BananaSuckers! I am reminded of Infecting Guatemalans with Syphilis & Then leaving them Untreated! What will be the End Result? Have you heard of Hyper-Vitaminosis with Vitamin A & Skin Color Turning Yellow? And So many related Health Disorders because of this U.S devised B.S! It's all just about systematical tendency of biotech companies to penetrate market and make money from fabricated needs. If they feel, that the African children suffer with need of vitamine A instead of plain malnutrition, why not to simply buy it for them? Actually it's just the transparent attempt, how to make them dependent on western patented technologies and as such even poorer. I just don't like it, even if the GMO would be positively harmless: it's unethical behavior. Sorry for the sarcasm, I don't usually like to communicate that way. However, given how completely off the rails the comments on this thread are, and given how unbalanced the individuals doing the commenting are I'd say a little bite in the communication might be necessary to have them take a deeeeep breath, take a step back, and then drop the histrionics and communicate without the drama....maybe several deep breaths and several steps back.